It’s 1991 and Steven Frazier has danced away half a decade in the Seattle club scene with his beautiful-but-poisonous best friend, Adrian. Two glittering princes against the world, too high above life to care about what they might be missing.But everything changes when a chance meeting with older—not to mention handsome—businessman John Pieters, reveals a cosmopolitan world and possible futures Steven’s never considered.Flashy club clothes won’t impress John, this charming man who knows so much about many things. Motivated by fantasies inspired by his crush on John, can Steven finally fight Adrian’s sick hold?As he steps out into the larger world, supported by new friends, Steven must prove to John—and to himself—that he’s not a hedonistic rhinestone club kid, but a true diamond in the rough. 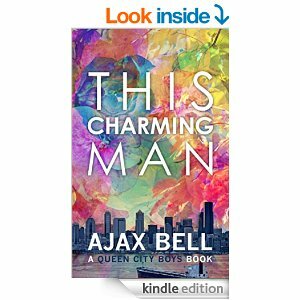 via This Charming Man Queen City Boys Book 1 – Kindle edition by Ajax Bell. Literature & Fiction Kindle eBooks @ Amazon.com..